The Glitch Mob, made up of EdiT, OOah and Boreta, is the straight crunkest bunch of music masters this side of oblivion; their sets of the dirtiest, stickiest, nastiest, most insane bass licks make dancers’ brains explode. The Glitch Mob is dropping the filthy sounds of the future up and down the West Coast and around the globe, crunking out crowds left and right and conquering the bodies of all who stumble into the insane dance riot that is a Glitch Mob show. The boys have pulled music out of the headphones and put the emphasis back on the live musical experience, and the community that is created from the energy on the dance floor goes absolutely freaking bananas to their obese bass licks and cut-up vocals. You walk off the dance floor at a Glitch Mob show transformed; their music serves the social function of unification through movement, and there is no going back. 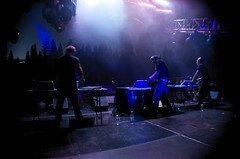 Defying all categorization and forcing writers to make up new words, the Glitch Mob rejects traditional instrumentation and instead relies on robotic bleeps, mechanical clicks and scratches, erroneously produced noises never found in nature and an army of bass, often overlaid with gritty and organic rap lyrics. The original beats of slam down as the sound of the future; their music symbolizes the failure of technology and the debunking of the modern myth that progress will save us all. Progress won’t save us- but dancing just might. Catch the Glitch Mob at Symbiosis Gathering which takes place September 17-21 at Camp Mather on the edge of Yosemite; this music, art and conscious-lifestyle festival promises to be the most forward-thinking and bass ridden outdoor party of the year. I freaking love dem Pretty Lights! Click through here to check out this Pretty Lights video from a recent Austin performance found on Roxwel.com; there is also a second featured video here that is an interview with Derek Smith, aka Pretty Lights. The video is cool at lasts about fourteen minutes- but the music is the real treat. Pretty Lights was my favorite performer at this year’s Electric Daisy Carnival and provided my most intense “this-is-why-I’m-alive” moment of the weekend. It was epic. Pretty Lights is on tour! LA welcomes the artist October 14 at the Key Club, he plays Nectar in Seattle on October 17, and will also be rocking my world at Symbiosis Gathering by Yosemite in September. Check other tour dates here, and oh- and you can download both of Pretty Lights’ albums for free on his website here. Awesome!